The new cookery books for 2015 cover a wealth of food-related topics, from recipes and manuals, to health tips, anecdotes and advice on nutrition. M. JOSEP JORDAN. The original TV chef (5,000 programmes in 22 years) has published “En familia con Karlos Aguiñano” (Planeta), a tome of 350 “simple and economic” recipes that is sure to be a hit with families. “My first memory of cooking – I was about 12 – is at home, following my mother's instructions in preparing a tomato sauce,” says the popular chef. Arguiñano insists that cookery knowledge begins at home, which is the focus of the book. Before his children left home, Arguiñano says the family ate together every night, which he argues is the best way of instilling an appreciation for food, as well as a great way to share experiences, and no doubt a few jokes. For gastronomy journalist Pau Arenós, the TV-3 programme “Cuines” is like yoga: “I am hypnotised by the explanation of a recipe,” he says. The iconic programme, directed by Tana Collados since 2010, has published a book with a selection of dishes organised by season. The book includes recipes from leading chefs, such as Carles Abellán, Sergi Arola, Jordi Cruz, Joan Roca (who writes the prologue) and Albert Adrià. The latter, who has just won a Michelin star for his Pakta restaurant, is also in Arenós's book, “Los Once”. The journalist tells the stories of 11 chefs “opening the way to the future”. The book includes Eneko Atxa and Josean Alija, the two-star Michelin chef Ángel León, the winner of the Acadèmia Nacional de Gastronomia prize Paco Pérez, and Paco Roncero. Enzymes are the secret ingredients that turn food into nutrients, energy, tissue and the building blocks of the anti-immune system. These substances are made by the body, as nutritionist Montse Folch explains in “L'enzim mediterrani” (Columna), which is full of advice for choosing food that helps in the production of these chemicals. While it is not a recipe book, there are recipes and advice. For example, any traditional dish can be enriched by adding seeds, cereals or pulses. 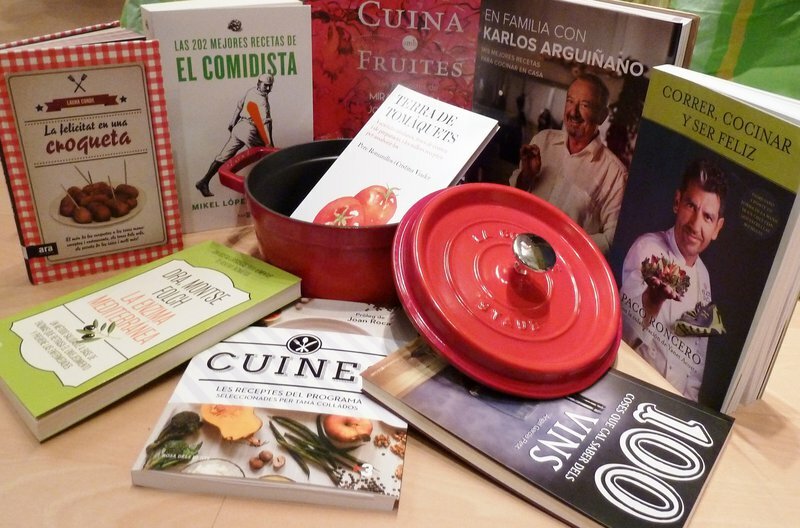 Mikel López Iturriaga writes about cookery on his popular blog, “El Comidista”. His is a peculiar but down-to-earth vision of food. His most recent book, “Las 202 mejores recetas de El Comidista” (Plaza&Janés) draws on his blog. As Mikel explains, “I have come to the conclusion that what you want from a book like this are solutions to our First World problems.” Exactly what his “easily accessible and healthy” recipes do. For 24 years, two-star Michelin chef, Paco Roncero, has run El Casino in Madrid. Roncero is no nutritionist but one day he discovered that a carefully controlled diet in conjunction with sport was the key to healthy living. At the time, the chef weighed 112 kilos, but in 2008 Roncero began jogging in the mornings. He has not stopped since, and has expanded his fitness regime with healthy dishes. The chef explains his transformation in his book, “Correr, cocinar y ser feliz” (Ediciones B), which includes recipes for maximising well-being. The croquet is not a Catalan invention. Journalist Laura Conde makes that clear in her book, “La felicitat en una croqueta” (Ara llibres). Nevertheless, there are no shortage of fans of this – French – dish in Catalonia. This manual about the humble but much-loved pasta rolls offers recipes and advice for making the best croquets. Conde even classifies the seemingly-limitless world of the croquet and asks famous chefs what their favourite types are. There are few things healthier than a good tomato. In “Terra de tomàquets” (RBA), Pere Romanillos and Cristina Viader dive into the world of the fruit that Catalans have made their own. Manuel Vázquez Montalbán described pa amb tomàquet as an “alimentary prodigy from little over two centuries ago and a sign of identity that is the equivalent to a mother tongue.” The book has recipes, a guide to Catalan tomatoes and tips on growing the fruit. Miracle Serra and Joan Targarona are mother and son who run the Cuina Miracle restaurant in Sant Just Desvern. With a focus on seasonal ingredients, their latest findings are related to fruit, which they explain in their book, “Cuina amb fruites” (Viena). “Cooking with fruit is a pleasure for the senses; it is cooking for the palate, for the eyes, for taste,” says Serra, who grew up in a grocer's shop in Sant Just. She went on to study fine arts but never gave up her love of the kitchen. Fifteen years ago she opened a food shop and then her restaurant in 2004. Introducing 100 things people should know about wine, Àngel García Petit aims to “provide a vision of wine that is open, understandable and demystified.” In his new book, this professor of oenology reviews the history of wine and explains the often bewildering varieties and types. We also discover that the drink that Pasteur called “the healthiest of them all” can provoke headaches in certain people, not because of a hangover, but due to a reaction to substances created during the fermentation process. To find out if this is the case, all we have to do is buy a more expensive version of the same type of wine and test it.